An PDF version of the new print map can be viewed online at tahoebike.org/where-to-ride/bike-map/. The Lake Tahoe Bicycle Coalition recently announced the completion of a new Tahoe Bike Map. The new paper map will be available for free at visitor centers and bike shops in the Tahoe Basin. The map, which was designed for the Bike Coalition by Truckee-based SDBX Studios, has been completely overhauled and features the latest Tahoe bike trails, according to information provided by the coalition. “Lake Tahoe is one of the best places on earth to ride a bike. We are excited to share these new maps with residents and visitors to make it easier for people to bicycle anywhere in the Tahoe region,” Sherry Hao, a board member with the Bike Coalition, said. The new Tahoe Bike Map depicts Tahoe’s South Shore on one side and the North Shore and Truckee on the other, with community insets to provide details for neighborhood streets and trails. The new map is a full redesign of the original paper Tahoe Bike Map, which the Bike Coalition has been providing since 2007. A PDF version of the print map can be viewed online at tahoebike.org/where-to-ride/bike-map/. This new map was designed to be aligned with Tahoe’s first region-wide online, interactive bike map, launched by the Bike Coalition in 2016. That map can be found at tahoebike.org/map. Both maps allow users to choose from among separated bike trails, on-road bike lanes, and designated bicycle routes. Funding for design, printing, and distribution of the new map comes from the California Tahoe Conservancy, city of South Lake Tahoe, Douglas County, Incline Village, Tahoe Fund, Tahoe Regional Planning Agency, and Washoe County. “We are grateful for the support of the jurisdictions, agencies and organizations — efforts like this make it easier for visitors and residents alike to hop on a bike and enjoy some of the best scenery in the world,” said Gavin Feiger, board member with the Bike Coalition. 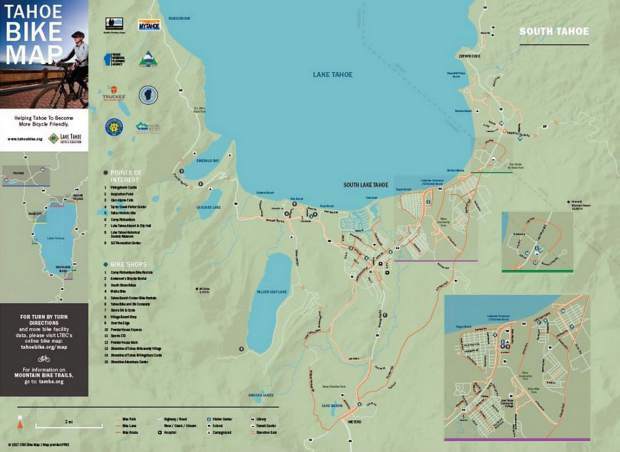 The Lake Tahoe Bicycle Coalition is distributing the new maps to bike shops and visitor centers throughout the Tahoe-Truckee region, as well as Reno and Carson City. In partnership with the Cycle California! magazine, the Bike Coalition will also make copies available at an additional 300 bike shops throughout Northern California, to encourage visitors to come bike at Tahoe. The Bike Coalition is a member-supported nonprofit with a mission to help Tahoe become more bicycle friendly. Learn more at tahoebike.org.